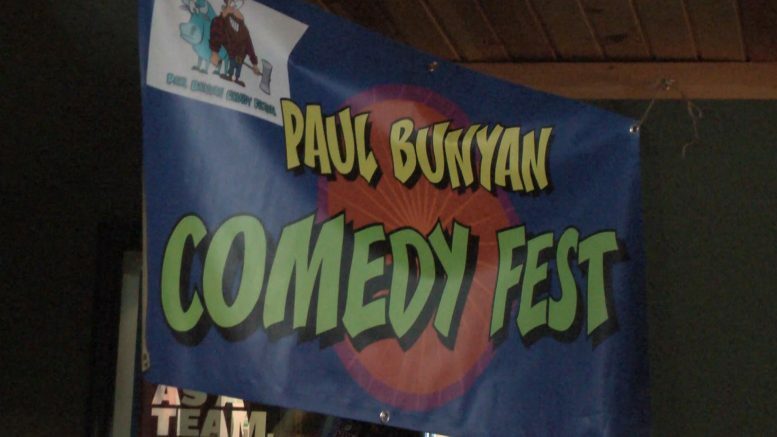 (Photo Courtesy/Mike Beiermeister) The Paul Bunyan Comedy Festival turns two-years-old this weekend! Oscoda Township, Mich. — If you need a couple of laughs in your life, the Sunrise Side certainly has that Friday and Saturday. Comedians from all over the country battled through blizzards to perform st the 2nd annual Paul Bunyan Comedy Festival. Festival organizer Brandon Young is excited to bring these nights of laughing back to the Hilltop Bar & Grill. All proceeds from ticket purchases go towards the Alzheimer’s Association. Last year, the festival raised just over $2,000 for the cause. This year, they are hoping to top that and raise $3,000. “We’ve got eight comedy shows coming this weekend, and, in one weekend, that’s pretty darn impressive,” said Young. For a full list of shows and to buy tickets, visit the festival website www.paulbunyancomedyfest.com. You can also buy tickets at the door.